Water, soybean oil, distilled vinegar, sugar, honey, prepared mustard (water, vinegar, mustard seeds, salt), grainy dijon mustard (water, mustard seeds, vinegar, salt, white wine, citric acid, tartaric acid, spices), salt, dijon mustard (water, mustard seeds, distilled vinegar, salt, cider vinegar, potassium metabisulfite), corn sugar vinegar, vinegar, mustard flour, garlic powder, egg yolks, modified corn starch, onion powder, spice, xanthan gum, sorbic acid and calcium disodium edta (used to protect quality), reb a (stevia leaf extract), annatto extract, beta carotene. 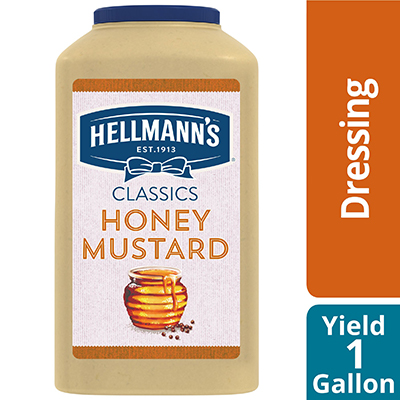 Hellmann's line of Blue Ribbon CollectionTM Dressings offers premium quality with shelf-stable convenience. These dressings are also versatile, with alternative applications ranging from marinades and dips, to glazes and finishing sauces.